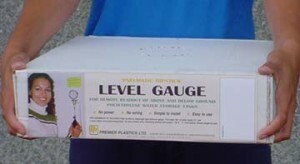 Measure the level in your water storage tank – from the comfort of your own garage! 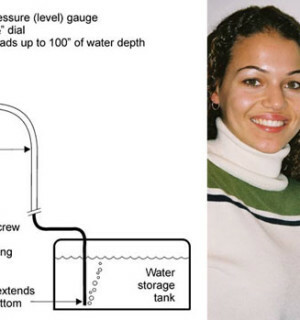 The water level in the dip tube is normally at the same level as the water in the tank. The pressurizing bulb pushes air into the tube which increases the pressure in the tube. 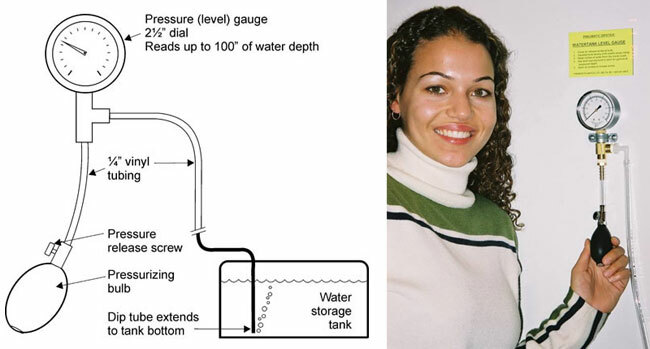 As the pressure increases, the water in the dip tube is pushed downward until it is completely expelled from the tube. The reading on the gauge shows the pressure in inches of water which is the same as the depth in the tank. Accuracy of the gauge is approximately 2%. Note: 1 p.s.i. = 28 inches of water depth. Continued pumping of air into the tube will not change the reading on the gauge after all the water has been expelled. The vertical position of the tank has no effect on measurement. Eg. in the ground, on the roof or up a hill. Suitable for water depths up to 8 feet. Locate gauge and bulb assembly on wall in garage, utility room or shed. needed. Remove and plug tube end when not in use. Drill a 23 /64 inch hole in the top of the tank. Squeeze the plain end of the tube through hole. Squeeze tube end through hole in sinker weight with approximately 1” protruding from other side. Pull the tube until the end rests freely on the bottom. Extra length of the tube inside the tank will not affect the measurement. Seal tank penetration as necessary. Affix instruction label above the gauge. Slope the tubing down towards the tank and bury below the frost line if possible. This will prevent condensation freezing and blocking the tube. Be careful not to crimp or crush any of the tubing. Test system before and after backfilling. Make sure pressure release screw on bulb is closed. Squeeze the pressurizing bulb slowly several times until the gauge needle stops rising. Read inches of water from the inside scale. Refer to tank manufacturer’s information for water volume at various levels in your specific tank. Suggestion: Mark on the dial cover the full tank position of the needle. Disconnection in air line tubing. End of tube is above water level. Blockage, kink or restriction in air line tubing. At last! A simple and fast method to accurately measure water levels in storage tanks – for much less than competing electronic or ultrasonic devices. There is no limit to the horizontal distance between the storage tank and level gauge, and no limit to the vertical separation. The storage tank can be above or below the gauge location. The heart of the system is the high sensitivity diaphragm type altitude/pressure gauge that reads directly in inches of water (full scale: 100 inches or 3.6 psi). This type of gauge is not to be mistaken for the more common (and much less expensive) Bourden tube type pressure gauge.